There was a time when taking your muscle car out in the snow for even a tentative drive was a no-no. Hit 2018 and the modern muscle car can take on any weather conditions, just like any other vehicle, but with the added advantage of topline muscle power. This particular Dodge Hellcat isn’t just your stock from the factory 707hp monster, but a souped up version hitting 1000Hp, with upgrades that include ‘2.85 Pulley, ID1000 Injectors, JBA Catless Pipes, Full Solo Performance Exhaust, Custom intake, Nitrous Express 150 Shot, and Dyno Tune on 93.’ The video shows you day and night time driving so also some cool donuts in various levels of snow, just to give you an idea of how well it copes. 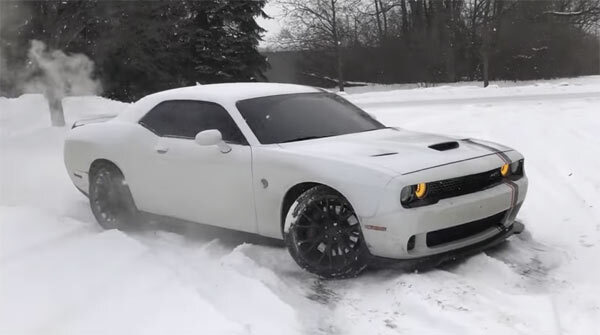 Not only is the Hellcat throwing shapes in the snow also chucks out flames from the rear, just for that added extra bit of eye candy. If you were in any doubt that the Dodge how Was only capable of dragstrip runs, then this video may just change your mind. Next Story → Two Dodge Demons Spotted!